I grew up in what some would call an immaculately clean home. I hated my mom a little for it. I wasn’t allowed to paint my nails, since they’d chip and “look trashy.” My brother and I didn’t run around in clothes that had holes or were stained. In fact, I still rarely wear white. As a kid, I didn’t understand why my mom’s focus stayed on making sure the floors were vacuumed and the kitchen counters wiped instead of playing outside with us. Cleaning seemed to make her happy. Now that I’m an adult, and a single mother with two young kids, I’d much rather have a clean house than a dirty one, and spend about an hour a day doing some kind of cleaning, whether it’s laundry, cleaning floors, or scrubbing the toilet. But over the years I’ve noticed a lot of the women sharing this meme were middle to upper class. They only associated mess with fun. They didn’t associate dirty and mess and stains with being poor. My mom grew up in extreme poverty, and always spoke of it with a look of disgust. She felt pressured to fit in, and felt shame about her house, clothes, and general appearance. When my brother and I were young, we begged my parents to take us to buffet-style restaurants with the endless soft-serve machines. My mom would cringe, and tell the same story about when her parents would run out of grocery money, they’d save just enough for the family to go out to eat, gorging themselves in one last hurrah before facing a week of empty cupboards. Nearly a decade ago, I started my journey of raising a family on my own with very little. I made the best of what I could with what we had. Even if I found a shirt or toy in a free pile, I took immaculate care of it. I couldn’t afford to replace it. Over the years, as I lived in low-income housing, collected government assistance, and lived well under the poverty level as I put myself through college, the comments people made about poor people started to sting. The poor are dirty. Hoarders. Their houses are a mess. Their kids are wild, untamed, and feral-looking. Many of my single mom friends and I had a fear of appearing poor, especially when we bought groceries with food stamps, or used WIC checks for milk. I cleaned the houses of the wealthy those years I was in college, and felt the stark contrast in how the other half lived. I pulled up to their driveways in my old car that leaked oil, in tattered clothing that would be replaced with my tax refund or out of extreme necessity. The majority of these houses were not without piles of clutter, and I had to work around it. Closets had mountains of clothes, offices had desks covered in papers, and I saw a lot of unfinished projects on dining room tables. But what does that mean for my living space? I live in low-income housing, across the street from some pretty nice apartments. I watch people move in and out of them, and I’m always fascinated at the size of their televisions, their amount of rugs and lamps, and clothes carried in proper bags with hangers sticking out of the top. When people move in and out of my building, so do heaps of trash bags full of clothes and outdated furniture. Even the wording in our lease states what is and isn’t acceptable for standards of housecleaning and items that can be left on the patio. When my property manager’s budget for lawn care dwindled last year, it was a stark contrast to the manicured lawns across the street that received weekly groomings. In walks down the street in the neighborhood, the difference between the income levels in the apartment buildings that stood across from each other were obvious. I felt a bit of shame in that. My neighbors in the nicer complexes that surround me might be the type who believe it’s a sign of a good mom to have a cluttered, messy house with craft projects covering the tables, fingerprints on the windows and walls, and laundry in piles. I’ve never felt I had that privilege. Living in poverty doesn’t afford you the right to a messy house. 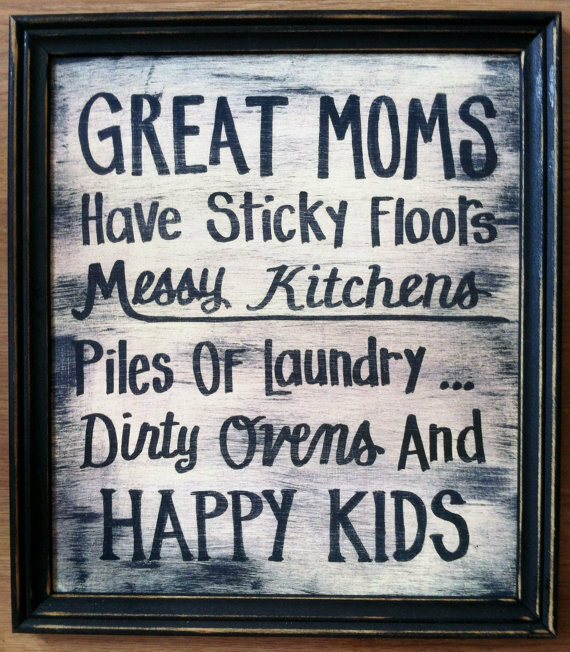 A mess means trashy and neglectful, not a doting mother. Stephanie Land’s work has been featured through The New York Times, The Guardian, the Economic Hardship Reporting Project, and as a writing fellow at the Center for Community Change. Follow her @stepville. What do you do when you can’t afford child care? You get creative. I blamed my wife for our messy house. I was wrong for many reasons.